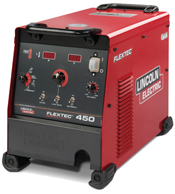 delivers up to 500 A of welding power along with the latest inverter technology for faster arc response and considerable energy savings. The machine’s multiprocess capability includes SMAW, GTAW, GMAW and FCAW, as well as arc gouging. The Flextec 450 includes variable arc force, allowing an operator to dial in the soft or crisp arc characteristics required for a specific application.